Craig Hignett will not alter his philosophy at Hartlepool United - despite the crushing defeat at Bristol Rovers. After all the promise of Saturday’s draw with Northampton Town, the wheels came off in spectacular fashion at the Memorial Ground where Pools lost 4-1 to Darrell Clarke’s top six side. With another difficult awayday to follow at Barnet, the new Pools boss could be forgiven for a change of policy this Saturday. “I won’t change the way I play or how I think about the game, the personnel may change though,” he said. 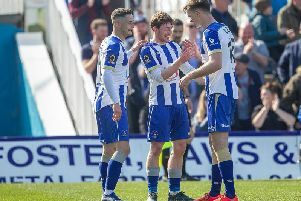 Hignett is no tea-cup-chucker or a man to turn on the hair-dryer, but he revealed to SportMail that he had some hard words to say to the team afterwards. “I’d like to think I am fair and I’m not a bloke who will rant and rave,” he said. “If you do that every week, I think it loses its effect. “I will rant and rave at the right times. “I didn’t do that on Tuesday night, I was just honest, the lads have to take it on board, they know what happened in the game. Every goal Pools conceded on Tuesday night was more or less put on a plate for them by the men in luminous green. But for an offside flag, a brilliant second-half Trevor Carson save and some brave defending after the break, the Rovers scoreline could have been even greater. For Hignett, the frustration was heightened by the fact that Pools appeared to have turned the corner against Northampton after a run of goal blunders. “The players have to learn from this,” he said. “We can’t keep giving individual errors every week. “We’ve done it three out of the five games I’ve been here, mistakes which have cost us goals. For all the Gas could have had more, Pools were unfortunate not to have had a bigger tally. Hignett had no qualms about the final scoreline but says they must now draw a line under it and move forward at Barnet. “I had no complaints about the result,” he said. “Darrell’s team played really well but I was disappointed in my team, that wasn’t us. “We’re away from home again and it’s a tough one, but we’ll forget about Bristol.